As a Mediterranean coastal city, Barcelona is particularly vulnerable to climate change. Its high population density also magnifies the local heat island effect which causes an array of health and environmental challenges. Climate change projections include a rise in average temperature and a significant decrease in rainfall, with expected lasting droughts and intense heat waves. In response, Barcelona has committed to becoming a global model of a sustainable city combating urban development challenges related to climate change and population density. In this context, Barcelona has been focusing on planting and managing trees for many years and currently is completing the “Trees for living. Barcelona Tree Master Plan 2017-37”, in lines with the goal of the Barcelona Green Infrastructure and Biodiversity Plan 2020 (BGIBP). With regard to their climate adaptation benefits, trees modify the urban microclimate and temper the climate conditions by providing cooling through shade and transpiration. In addition, the reflection of sunlight by the leaves lowers the temperature in pedestrian areas and the shade protects people from the sun, especially during the hottest months. Furthermore, trees can prevent possible local flooding by helping to reduce the amount of storm water runoff. Main climate change challenges for Barcelona are related to rise in temperature, significant decrease in precipitation and increase in related extreme events such as droughts and heat waves. The high urban density can act as a driver exacerbating the heat island effect. The implementation of a network of trees as a green infrastructure and climate change adaption measures brings a number of challenges that must be taken in consideration for their proper management in particular in climate changed conditions. On the one hand these challenges include: health and safety risks due to pollen, risk of falling trees or branches, tree pests or diseases, and limitation of the space availability for other uses. On the other hand, trees are experiencing water and heat stress during the summer dry season that will be likely aggravated in the future due to expected climate changes. Intense sunlight and high temperatures cause high rates of evapotranspiration and water loss from leaves. This is accentuated by buildings reflecting sunlight and not dissipating energy due to the lack of evaporative surfaces, therefore further heating-up the atmosphere. In addition, the effect of air pollutants emitted by urban activity, mainly vehicle traffic, must also be taken into account. And to make matters worse, trees have a much smaller water reserve because the ground is impermeable (e.g. tarmac, pavements). These environmental conditions, which are far from ideal for trees to grow in, lead to water and heat stress, which is manifested to a certain extent by partial defoliation well before autumn. Leaf loss is a defense mechanism that reduces water loss and thereby prevents dehydration. Windy days favour the massive fall of weakened leaves. This does not signal the coming of autumn, but rather it is quite simply how trees defend themselves in the city. In Barcelona, this phenomenon particularly affects plane trees. The “Trees for living. Barcelona Tree Master Plan 2017-37” (hereafter “Tree Master Plan”), currently being drafted, will become the strategic document giving Barcelona City Council guidance for future actions in municipal planning, management and conservation of the arboreal city. With the Green Infrastructure and Biodiversity Plan 2020 (BGIBP) - which is the “umbrella” strategic plan for actions related to green infrastructure and biodiversity - and the Trees Master Plan, the city has the vision to create a well-managed, healthy and biodiverse woodland aiming to: connect to both the urban and natural environment, be resilient and adapted to climate change, provide benefits to urban people and be appreciated for its value. According to the Plan vision trees are considered a fundamental part of the green infrastructure of Barcelona, a natural resource that helps enjoying a healthier life in the city. Trees conserve and increase urban biodiversity, connect people with nature, provide social and environmental services (e.g. related to health, habitability, landscape, etc.) to current population and future generations. The conservation of this green heritage is promoted by the Barcelona City Council with the involvement of everyone, both public and private organizations and citizens. The management of street trees was already included as an action in the earlier Barcelona Green Infrastructure and Biodiversity Plan 2020 (BGIBP), which is the “umbrella” strategic plan for actions related to green infrastructure and biodiversity in Barcelona. Besides setting out an action plan, the BGIBP provides for a model of an urban green network and a city where green elements are not ornamental accessories but rather genuine green infrastructures. In the broader context, the BGIBP is a component of the overall efforts the city of Barcelona is making in terms of sustainable development and resilience to climate change. In particular, with the BGIBP Barcelona seeks to enhance the city ecological, environmental, social and economic services by connecting various areas with vegetation to produce effective ecological infrastructure. The aim is to secure a city model where nature and urbanity interact and enhance one another for the benefit of citizens, to enable them to derive welfare from the natural heritage and be actively engaged in the protection and improvement of all areas. Because of the relevance of trees a Trees Master Plan is being completed as a separate document remaining in line with the goals of the BGIBP. To have trees being appreciated as a true urban infrastructure of first order and to favour cooperation between the municipal departments 10 strategic lines constitute the basis for the Trees Master Plan. These include: heritage and biodiversity, planning and connectivity, plant material, land, water, safety and pruning, health of trees, preservation and protection, knowledge, and communication and participation. These 10 lines will be displayed by 46 actions and a range of associated tasks that have been prioritised considering mandates and the timing of actions for the coming years. Species are selected suited to the environmental conditions and resilient to water and heat stress. 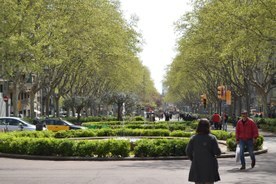 Furthermore, the city’s aim is for no one species to exceed 15% of the total of street trees in Barcelona. The reasoning behind this approach, which is being achieved gradually, is to avoid mono-specific populations vulnerable to pests and diseases. The species chosen are more resistant to pests and diseases, the best adapted to the low availability of water and preferably native. When needed, pest control is mainly approached through biological control. A limiting factor for street trees is that they mostly have very little space in the ground for the roots, with very little organic material and compact soil with little structure and deficient nutrition. In most instances, this is caused by the small width of the pavements and the tree pits. Therefore, in the public area, streets wider than six meters shall be located as they provide scope for transforming individual tree pits into continuous pits. Tree pit conditions shall also be improved in the remaining areas with street trees. In response to water and heat stress there is an increased use of runoff water in park and forest areas and alternatives to drinking water for tree watering are promoted. Furthermore, plants with low water requirements are selected and for each species of tree the appropriate irrigation is determined according to their biology and where and when they are planted. Automatic irrigation systems are in place for the watering of trees and there is controlling for leaks for these systems. While Barcelona has a relatively low ratio of green space per inhabitant, it has more street trees than most other European cities. Currently there are over 200.000 trees of 150 different species lining the streets of Barcelona (approximately 1 tree for every 10 m of street), with new trees being planted every year. When including the trees in parks (about 36.000) and those in forest areas (73.500) all together about 310.000 trees are managed by the City Council. Case developed and implemented and partially funded as a CCA measure. 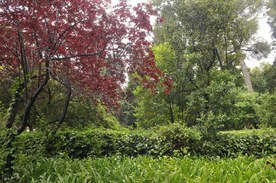 Communication and education; the City Council’s strategy focuses on citizen knowledge of the natural urban environment and its benefits, and respect for green spaces. For example, actions include the development and implementation of a communication strategy on trees, to promote education projects on trees in schools, to encourage public involvement in projects and to make use of new technologies for dissemination such as Apps related to trees. Participation; the City Council works with sector-based and territorial associations and institutions generally in relation to a specific space or group. For example, when developing the Barcelona Citizen Commitment to Sustainability 2012-22 document, over 800 organisations were involved, including businesses, civic and professional associations, trade unions, foundations, universities, schools and various areas and districts of the local administration. Cooperation; it includes involvement in the design of green spaces. The formation of these spaces by technical services often derives from participation processes including both residents and the district representatives. Such participation often involves brainstorming and the identification of needs by users which are then reflected in definitive project plans. To succeed in greening Barcelona it is key to have broad stakeholder participation. Indeed, in order to further advance and bolster local leadership, networks need to be created and institutional relations strengthened with the organisations involved in the conservation of biodiversity and green infrastructure in the city. Stakeholder participation and volunteer actions need to be balanced with the integration of biodiversity goals and green infrastructure objectives in policy and legislation. In particular it is of great value to legally enshrine the linkage between urbanity and nature in urban planning projects and spatial planning. The Trees Master Plan as a single action already provides benefits in terms of adaptation to climate change. However, the impact of this plan is much more far-reaching because it is only one action within a much broader set of actions Barcelona is implementing in greening the city and addressing climate change. Also, the greening of the city has many more benefits than resilience to climate change only, with several ecosystem services that will be increasing in value. 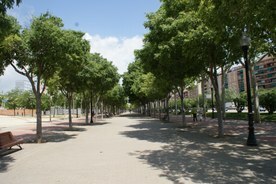 Considering the costs, the estimated budget of the Trees Master Plan is 9.6 million euros/year. Of this budget 8.3 million Euros/year is already available for tree management. The difference of 1.3 million euros/year relates to necessary investments mainly in the areas of improved soil and water management. Trees can improve the urban microclimate and temper the climate conditions by providing cooling through shade and transpiration. In addition, the reflection of sunlight by the leaves lowers the temperature in pedestrian areas and the shade protects people from the sun, especially during the hottest months. Furthermore, trees can prevent possible local flooding by helping to reduce the amount of storm water runoff. Therefore, they can have a relevant role in urban climate change adaptation. Trees can also provide a number of co-benefits. 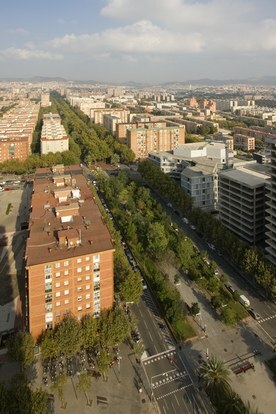 In a single year, the trees in Barcelona are able to remove more than 305 tons of air pollutants accounting for an estimated value to society of 1.12 million Euros (numbers are for 2008). Further, the annual storage of carbon in the city’s trees amounts to 113.000 tons. Trees and, more generally, plant cover, further also reduce noise pollution, regulate dampness, balance the water cycle, reduce energy consumption in buildings, create ecological connectivity, and serve as a habitat for more biodiversity. It also affords a more pleasant urban landscape and can serve as a place for socialisation or gatherings, and as a location for taking a stroll or engaging in sports and leisure activities in the open air. The conservation of biodiversity and the strengthening of green infrastructure have been incorporated into the local political commitments and human and financial resources have been allocated to it. Moreover, work is carried out in a coordinated manner ensuring goals are aligned with other similar municipal local projects and plans, other institutions and bodies affording knowledge, energy and actions with a view to building a future-proof Barcelona. The recently enacted environment bylaw incorporated the concept of biodiversity for the very first time. Also, progress has been made in metropolitan urban planning in taking care of open spaces (Territorial Plan for the Metropolitan Region of Barcelona). For current urban planning projects, preservation criteria and measures have also been incorporated. That trees are essential in a dense compact city like Barcelona is also confirmed by the Barcelona Charter, the “Declaration of the Rights of Trees in the City”, drawn up and signed in Barcelona on the occasion of the first congress of the Spanish Association of Arboriculture. This Charter establishes the rights of trees in the urban environment. Since 2001, Barcelona City Council has implemented an environmental management system with UNE-EN-ISO 14001-04 certification in the field of management and maintenance of public green areas and street trees. 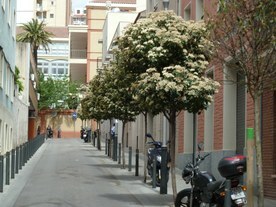 Additionally, via a list of recommendations and through the application of the Granada Regulations the city provides guidance on how to protect trees during construction work on public roads, while unique specimens are protected by the Catalogue of Trees of Local Interest. Finally, it is important to say that according to the city’s environmental legislation all trees are considered part of Barcelona's arboreal heritage, both those in areas of public and of private property. While the City Council is concerned with the management of the municipal property trees, its overall responsibility is to preserve the broader arboreal heritage in order to improve the environmental quality of the city and enrich biodiversity and accompanying ecosystem services. The Trees Master Plan is currently going through a participatory process to incorporate suggestions while some actions are already being implemented. Various actions will be implemented in many years, while others have shorter implementation time. The lifetime is foreseen for a timeframe of 20 years. During this time the plan will be further reviewed when necessary.